Ever since Hurricane Harvey struck Houston last year with a record-breaking deluge, the city has been awash with warnings that more catastrophic storms are on the figurative horizon. Some of these admonitions have been coupled with reminders that scientists say a warming climate is bringing warmer Gulf of Mexico waters, which can fuel more dangerous hurricanes. Many other warnings, however, haven’t been tied explicitly to climate change. Earlier this month, researchers published a new study about Harvey that combined first-ever findings that link ocean-water temperatures and hurricane rainfall in a particular, compelling way. Based on these conclusions about Harvey’s precipitation, the scientists added their own voices to the chorus calling for at-risk cities like Houston to do a better job of strengthening themselves against hurricanes boosted by climate change. “We know this threat exists, and yet in many cases society is not adequately planning for these storms,” said Kevin Trenberth, a senior scientist at the National Center for Atmospheric Research (NCAR) in Colorado and the study’s lead author. “I believe there is a need to increase resilience with better building codes, flood protection, and water management, and we need to prepare for contingencies, including planning evacuation routes and how to deal with power cuts,” Trenberth said in a statement released by NCAR, one of the world’s foremost climate-research institutions. Two earlier studies by other researchers, published in December, found that manmade atmospheric warming had made Harvey worse than it would have been otherwise. The new study by Trenberth and others, published in the scientific journal Earth’s Future, is the first to show that ocean water that evaporated as Harvey passed across the Gulf matched the volume of the storm’s devastating rainfall, which inundated much of Houston and other locations. 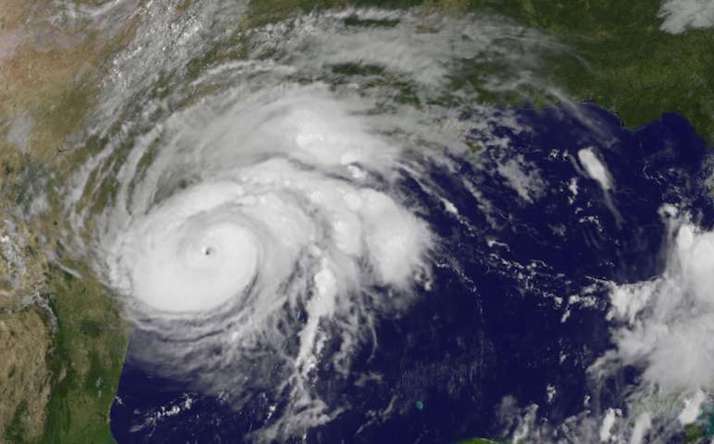 “While hurricanes occur naturally, human‐caused climate change is supercharging them and exacerbating the risk of major damage,” the researchers wrote in Earth’s Future. Using a network of autonomous floats called Argo, the scientists compared Gulf-water temperatures before and after Harvey’s landward trek. They employed rainfall data from NASA’s new, satellite-based Global Precipitation Measurement mission. We show that prior to the beginning of northern summer of 2017, ocean heat content was the highest on record both globally and in the Gulf of Mexico, but the latter sharply decreased with hurricane Harvey via ocean evaporative cooling. The lost ocean heat was realized in the atmosphere as moisture, and then as latent heat in record‐breaking heavy rainfalls. Accordingly, record high ocean heat values not only increased the fuel available to sustain and intensify Harvey, but also increased its flooding rains on land. Harvey could not have produced so much rain without human‐induced climate change. …has been quite inadequate in hindsight. There is a great need for better planning and building adaptive capacity that: increases engineering mitigation measures (such as levees and seawalls, flood control), adheres to building codes, prevents building in flood plains, stops unbridled growth, hardens infrastructure, manages water and drainage systems, develops emergency response plans including evacuation routes and their implementation along with emergency shelters and power supplies, and provides property and flood insurance that matches the true and changing risk. Government officials in the Houston area have taken some steps in Harvey’s aftermath to harden its defenses against catastrophic hurricanes – stricter new construction regulations adopted by the city of Houston, for instance, and a bond election planned by Harris County to pay for flood-control projects. Local, state and federal officials, frustrated by an influx of investors buying flooded homes and lengthy delays in disaster prevention funding, are working to overhaul the country’s buyout program, hoping to speed up sales that can now take years to complete. So far, they lament, none of the $10 billion approved by Congress for long-term flood recovery in Texas has made it to local governments, leaving homeowners in a lurch and neighborhoods open to investor speculation. Leaders, deeply concerned that they are losing buyout opportunities to such investors, have even started to talk about more punitive measures: [Federal Emergency Management Agency] chiefs have discussed canceling flood insurance policies for homes that have suffered multiple floods, and Harris County Flood Control officials have started talking about using eminent domain to forcibly remove homeowners from those houses.